Nevertheless, such a high adoption rate is not a surprising result. 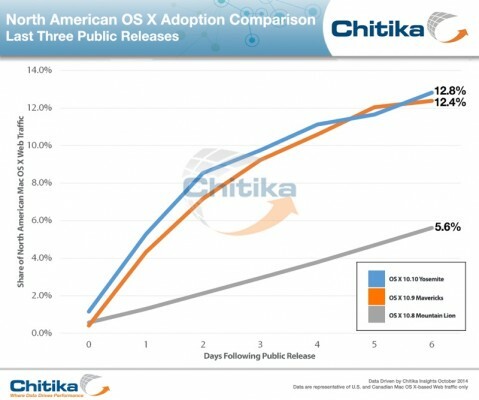 You see, ahead of the public launch this fall, the adoption rate of the latest OS X beta among the developers and beta testers was 33 times higher if compared to previous releases. OS X Yosemite has such a high adoption rate as it can boast of deeper integration with iOS 8, noticeable design tweaks and other improvements. While Mavericks focused heavily on under-the-hood updates that improved battery life and responsiveness, OS X Yosemite brought revamped apps, Continuity, Notification Center improvements, iCloud Drive, and more. Chitika also speculates that the OS's public beta may have positively impacted its adoption numbers. To measure the adoption rate of the new OS X version in Nothern America, Chitika experts analyzed the web traffic data gathered during a period of time between October 16th to October 22th.